Nothing like a Junkanoo Parade, a rich Bahamian tradition with drums, bells and whistles. Junkanoo Dancers with colorful costumes and big decorative head wear. A Junkanoo Band is a nice opening or closing entertainment act for any event. There are colorful costumes and huge floats surrounded by incredible dancers, we have the best female lead junkanoo dancer in the business. She is very interactive and gets everyone up to dance. 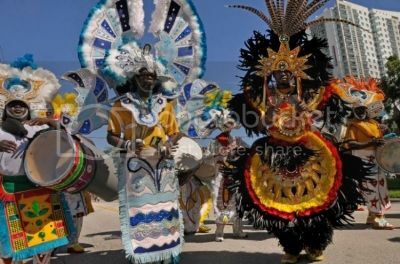 Junkanoo Band Bahamian Style Entertainment, perfect for grand openings, street fairs, grand finale and convention entertainment. Junkanoo Band at a Rehearsal Dinner in St Pete Florida. Our Junkanoo Dancers lead the guests in a parade from the down the street all the way to the reception area in the hotel then the dancers entertain the guests and soon to be newly weds for about 30 mins. The Junkanoo Parade is a national festival in the Bahamas, celebrated on Boxing Day, New Year’s Day and Independence Day. Its color and rhythm now delight people all over the world. 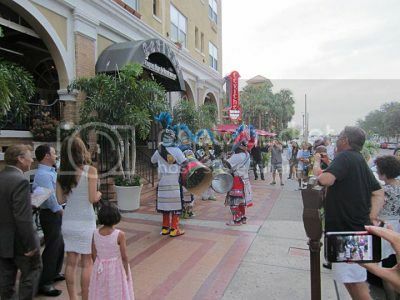 If you want to bring the talent and treasure of our Junkanoo Band in Florida to your next big event, you are in luck! At RythmTrail we have a world-class Junkanoo Band available all year around. All you need to do is contact us or Tel: 866 495 4522 and we will schedule the party of the year for you in Tampa, Miami, Jacksonville, Orlando, Destin or anywhere in Florida. Junkanoo dance troupes are made up of talented dancers who perform with musicians playing drums, horns, whistles and brass instruments. Their costumes are colorful and exotic. Your guests will rise up and dance to the hypnotic rhythm of the Bahamas. What could be more enrapturing than our beautiful performers who engage with every one of your guests? We know that you will fall in love with a Junkanoo Band the musical centerpiece of Bahamian culture. When you are planning your next big event, please contact us or Tel: 866 495 4522 for the experience of a lifetime. Post by RythmTrail Steel Drum Band. Once again thank you for your business… My wife and I enjoyed the band. Job well done! The Junkanoo Band did a fantastic job! All the members were on time and acted professionally throughout the evening. As for the show, their costumes were colorful and brought a festive atmosphere to their performance. The audience truly enjoyed the procession as they worked their way through the audience. At the end of the show, the band entered the stage to jam with the KCSB drummer and percussionist and KC, being inspired by the magical rhythms, jumped back on stage to dance with the group before exiting again. The Junkanoo Band truly helped to pay homage to the original KC and the Sunshine Junkanoo Band through their performance and I know everyone, including them, had a great time. I was thoroughly impressed with the band, particularly the young girl that was leading the group. She was very interactive with the guests and everyone had a wonderful time. I would not hesitate in recommending them. Event updates for our Junkanoo Band performances. Junkanoo Band performance Tonight for a Wedding Reception in Miami FL. Junkanoo Party with Moko Jumbies , a real Caribbean Party at all the Bahama Breeze Restaurants in Orlando area for the Island Junkanoo New Years Eve Bash. A great place to ring in the new year will be at Bahama Breeze on I-Drive for the ball drop and final show, count down to 2017. Our Junkanoo Band, junkanoo dancers will be on show tonight in Palm Beach FL at the Bath and Tennis Club for a wedding reception. 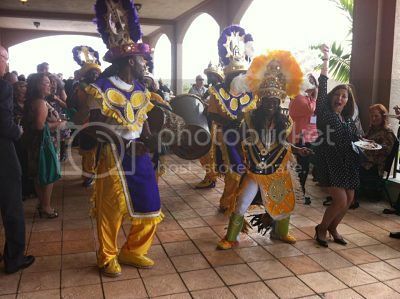 Also another Junkanoo Band performance tonight in Miami Florida at Vizcaya Museum & Garden for a wedding reception. Junkanoo band performance update Apr 2 2016. Tonight at Key Biscayne Yacht Club in Key Biscayne FL for a corporate reception. Hire the best junkanoo dancers in Miami FL area. Show update for Mar 19 2016, Tonight our junkanoo band will be opening with KC and The Sunshine Band in Hollywood FL at Seminole Hard Rock Hotel and Casino. This is the second year in a row our junkanoo dancers will be doing this show. Today Mar 19 2016 our Junkanoo Dancers will be performing at Rosen Shingle Creek Resort in Orlando FL for a corporate function. The best junkanoo band in Florida. Feb 21 2016 Tonight the junkanoo band and dancers will be performing at a corporate function at the Don CeSar in St Pete Beach FL. The Junkanoo Band and Dancers in Florida. Book A steel drum Band, Steel Pan Drums, Steel Drum Music or Steel Bands. RythmTrail performs at over 300 events yearly. RythmTrail Steel Drum Band travels everywhere. We do events in Florida, Georgia, South Carolina, North Carolina & Alabama.